As our existing patients will tell you, it will feel comfortable having your filling done because we allow enough time to carry out the procedure painlessly and comfortably. 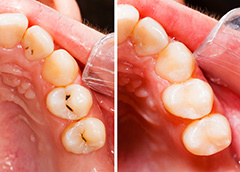 When the decay has reached a point where a filling has to be done, we are able to use the most modern white filling materials. By using the right material, we are able to provide you with a filling which gives maximum success. There is no one perfect filling material for all situations, but we have many years experience knowing exactly what materials work best in different situations. Composite white fillings are excellent at sealing and giving strength back to a weakened tooth. Glass ionomer white fillings release flouride, and are good at reversing decay. Sometimes we use combinations of materials in one filling to get the perfect result. Obviously some patients are nervous of having fillings. There is no need to worry. As our existing patients will tell you, we can ensure you feel comfortable having your filling done as we allow enough time to carry out the procedure painlessly and comfortably. Often we can avoid the need for fillings. Just because a tooth is decayed, it doesn’t mean it has to be filled. When we detect decay at an early stage, there are a number of techniques that we use to to avoid the need for a filling. We can paint sealants and gels on the tooth, which can reverse the decay. We can also give you a personalised oral hygiene program, which has been shown to prevent and reverse tooth decay.